As I was mentioning in Monday’s article, the US billionaire T Boone Pickens issued a most impressive plan on energy independence for the United States of America. Mainly based on the massive use of wind energy, alongside with solar, this plan might bring huge changes in the United States’ energy mix and greenhouse gases emissions. Shifting a fifth of the US electricity mix to renewables – as Pickens proposes – is a great idea that proves to be realistic and economically viable. 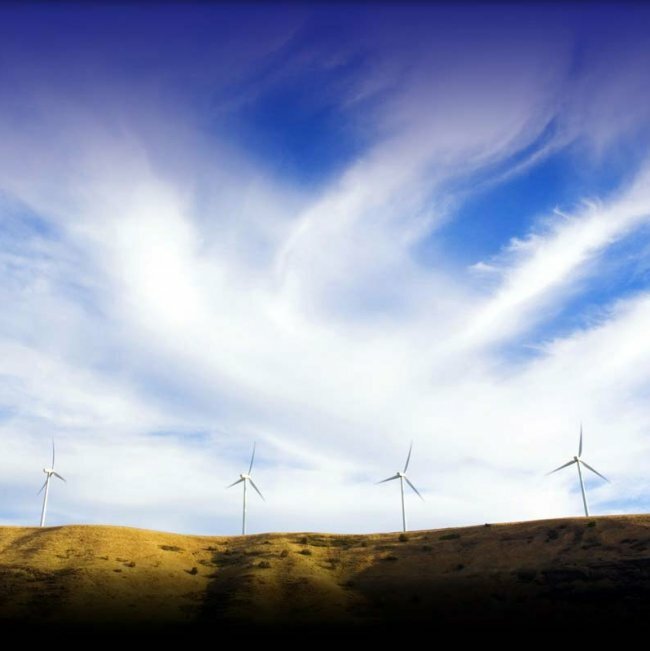 The Department of Energy reports that 20% of America’s electricity can come from wind. North Dakota alone has the potential to provide power for more than a quarter of the country. Today’s wind turbines stand up to 410 feet tall, with blades that stretch 148 feet in length. The blades collect the wind’s kinetic energy. In one year, a 3-megawatt wind turbine produces as much energy as 12,000 barrels of imported oil. (…) Building wind facilities in the corridor that stretches from the Texas panhandle to North Dakota could produce 20% of the electricity for the United States at a cost of $1 trillion. It would take another $200 billion to build the capacity to transmit that energy to cities and towns. That’s a lot of money, but it’s a one-time cost. And compared to the $700 billion we spend on foreign oil every year, it’s a bargain. (…) In addition to creating new construction and maintenance jobs, thousands of Americans will be employed to manufacture the turbines and blades. These are high skill jobs that pay on a scale comparable to aerospace jobs. Plus, wind turbines don’t interfere with farming and grazing, so they don’t threaten food production or existing local economies. (…) We currently use natural gas to produce 22% of our electricity. Harnessing the power of wind to generate electricity will give us the flexibility to shift natural gas away from electricity generation and put it to use as a transportation fuel — reducing our dependence on foreign oil by more than one-third. Even if no mention is done of climate change or global warming, this plan if carried out fully would decrease in an important way US greenhouse gases emissions. If you are interested by this plan, please have a look at the official website or at this most interesting article from Clean Technica. Be sure that I will keep you posted on the advances of this plan. So for this and for much more, stay tuned ! Pingback: Sustainable development and much more… » Could both sides - and plans - work hands in hands ? Thanks David for the comment. I maybe am optimistic about Pickens plan, but to me, it is still better than doing nothing. Furthermore, natural gas emits less than oil, which is to me already a good thing. Edit after reading the article you linked : And even if this part of the plan doesn’t work and we achieve the same CO2 reduction thanks to efficiency and conservation, we would still have this great plan on wind power. Then, less electricity from coal – the most polluting solution, by very far – and more from wind energy is also a good point. Of course, we don’t need cars for a couple of kilometers ride and so on… let us bike, walk and so on. ← An inventive solution to the methane emissions of cows ?